Whenever Wall of Tears blocks a creature, return that creature to its owner's hand at end of combat. Depends on the decks you face regulary. I don't like Wall of Tears too much because I try to attack as often as possible So I rarely block. Also mana/toughness isn't that good. This is also the reason why I don't include Wall of Nets . 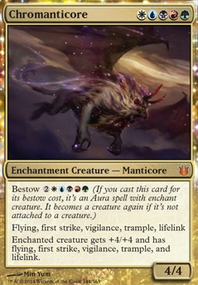 If you consider adding it to your deck you should also have something to give your creatures vigilance. Wife came across this gem Wall of Tears Ideas? Worth it cut it ideas? Sugerencias: Stalwart Shield-Bearers, Overgrown Battlement, Perimeter Captain. Control? : Suspicious Bookcase, Wall of Tears, Meekstone, Marble Titan. Card suggestions: Steel Wall has amazing value mana value and Traproot Kami is incredible (especially considering it counts enemy forests too). Wall of Resistance isn't great but it has a lot of potential to get big. 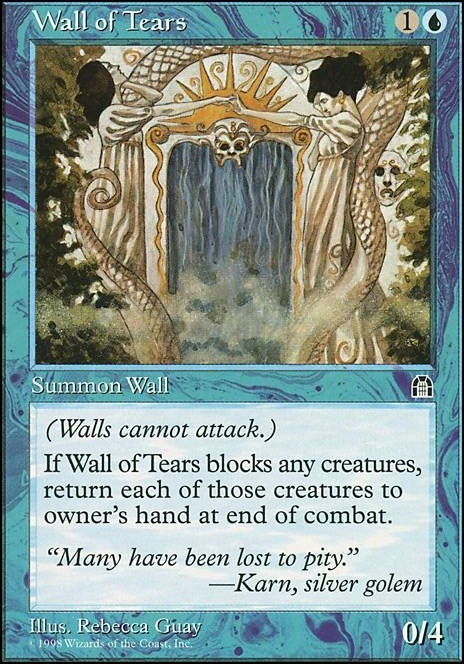 Wall of Tears is nice as an even bigger deterrent than all your other defenders are. The glyphs: Glyph of Delusion,Glyph of Life,Glyph of Reincarnation, have some neat utility here though not amazing. 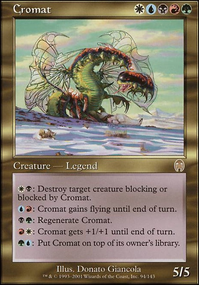 Sprouting Phytohydra has amazing recursion where every-time its token re-enters you draw another card (if arcades is out). 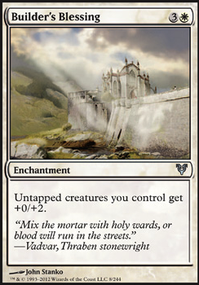 This is especially easy if someone has a burn deck where it hits all the creatures on the board. Siren's Call is very good, especially since with all your deterrents you are sure to not take much damage if they target you and will most likely cause two opponents to both suffer. Skeleton Key is great as skulk fits perfectly with this deck theme. The second effect is just an added bonus. Warmonger's Chariot is important as you need as many ways to let creatures attack as possible. Dusk (and also Dawn) are very nice as well as Retribution of the Meek since even though they aren't board wipes, they rid the board of most threats and are sure not to hit 99% of your creatures. Great stuff! I recently built a similar deck (Coral Capers -- (Budget Seamonsters)) and I adore it. I definitely feel ya on the nakedness!! I put in (gasp!) a few wall-like creatures, such as Gomazoa, Guard Gomazoa, Fog Bank, Wall of Frost, and Spiny Starfish. 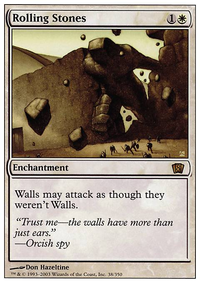 Walls are generally poo-poo'd in EDH for being one-dimensional and not actively helping one win but sometimes you just need a blocker or two. They help with devotion for Thassa too! So added functionality there. Wall of Tears is a good one as well.